Pics and Kicks: Photographer Raleigh. Sorry for the crappy cell phone picture, but I just have to ask. 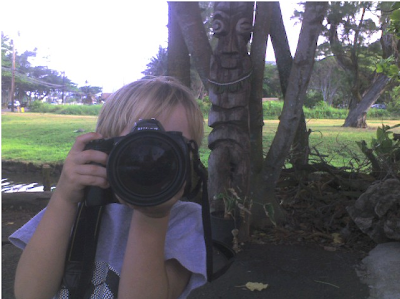 . . Is it crazy for me to assume that my 4 year old really has an eye for photography? I gave him my Nikon d70s today (set on Aperture Priority at 5.6) and let him just go at it. It was REMARKABLE what he came up with. I can't wait to post it. Would it be totally inappropriate to get him his own blog?! Yay, Raleigh! His own blog would be the coolest thing, ever! I saw a blog recently (sorry if you're reading this and would like name credit! I don't remember who you are!) where she posted all of her children's artwork. I loved it! You should totally get him his own blog! My friend Erica (Erica's Bloggity Blog) did the same thing with her little girl. She tells her mom what to write on it, and she posts her pictures from her little camera! Go RALEIGH!! You should give him every chance to try things new. Whenever my daughter asks to take photos I give her a go, we have had some good fun messing around with the camera. Every now and then she pulls off a real cracker. Well I don't think you are crazy. Presley is 6 and she can take some awesome pics. Any way can't anyone have a blog. Why not Raliegh. It could be super cute.